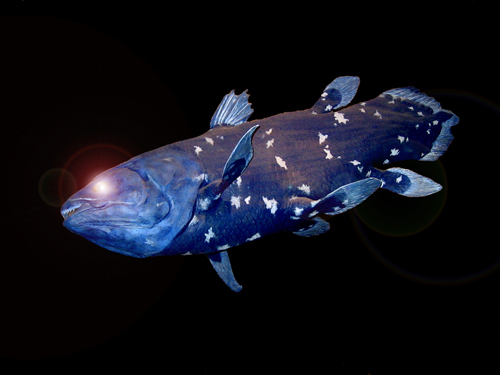 This is the astounding coelacanth ("see-la-kanth"), the fusion of life and time, that following a supposed extinction of 65 million years, head-lined into human consciousness with its discovery alive in 1938. Nicknamed "Old Four Legs" and the "Living Fossil," Latimeria chalumnae- the Coelacanth- quickly became the continuing obsessive focus of journalists, crypto biologists, scientists, eccentric explorers, aquariums, divers, film makers and billionaires. For full features use the Nav Bar at left. For a quick overview, see the illustrated "One Minute Coelacanth," below. My undersea encounter with coelacanths! Entire contents ©2019 Third Wave Media Inc.
Reproduction in whole or in part without prior written permission by the publisher is prohibited. This site is best viewed at 800x600 or higher resolution and requires a FRAMES capable browser.